Dental implants have forever changed the way dentists replace teeth. But many dental patients have very little knowledge about dental implants, as the process is a little more complex than dentures. That’s why in today’s blog we’re exploring what exactly is involved with the dental implant process. Dental implants replace missing teeth, similar to dentures. However, unlike dentures, dental implants cannot be removed. They are fixed to your jawbone through various surgical procedures using metal posts that look like screws. After the metal frame has been fixed to your jaw, the artificial replacement tooth is then placed to fill the gaps left by the missing tooth. Artificial replacement teeth are usually made of titanium or titanium alloys. They are specifically constructed to look just like your other teeth, right down to the size, shape and colour. This helps to make the replacement tooth look like it was always there. Over time, the surrounding bone will grow around your dental implant as part of the healing process. This helps to hold the implant in place for years to come. With proper oral care, dental implants can last at least 20 years. Dental implants do not shift or move in your mouth, unlike dentures. This makes it easier to eat and speak. 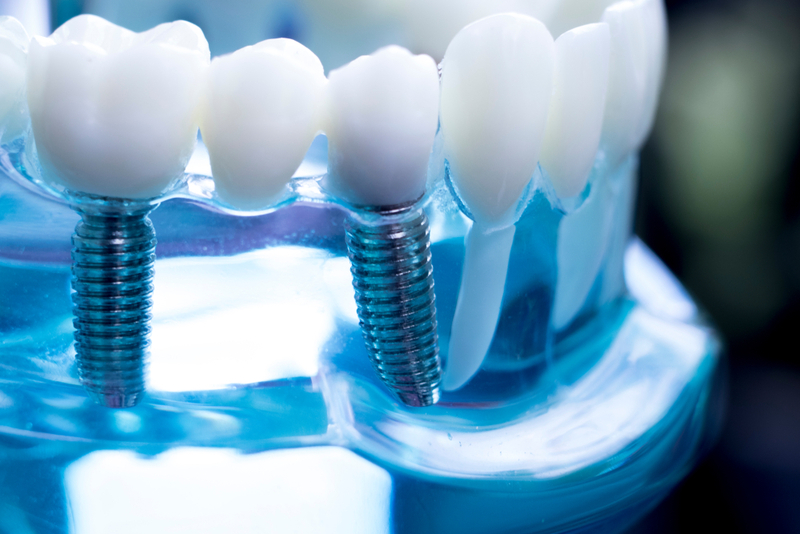 Dental implants may feel more natural than conventional dentures or bridges. Implants do not cause sore spots or gagging, while other tooth replacement procedures might. Your missing tooth (or teeth) are the only areas in your mouth that are going to be affected by dental implants. On the other hand, some other tooth replacement procedures tend to affect adjacent teeth. Be in good health, particularly when it comes to other issues such as tooth decay and smoking. What happens during the implant fitting process? First, you need dental x-rays and scans so that the dentist can determine the placement of the implant. You’ll then undergo a minor operation, during which the dentist will screw the metal implant frame into your jawbone. This is usually done under anaesthetic so that you won’t feel pain. You must then wait a few months (as advised by your dentist) while the bone heals and grows around the implant frame. After the implant frame is secure, your dentist will create a foundation for your new tooth. Your dentist will then take the impression of your mouth to form a mould for your artificial tooth so that it matches your other teeth. After the artificial tooth has been made, your dentist will screw it into the metal mould or cement it to the foundation. If you are concerned about the condition of your teeth, then dental implants may be for you. However, since not everyone is eligible for dental implants, it is important to book an appointment with a dentist and get some expert advice on your dental options. Eden Rise Dental is a local family-friendly dental clinic that is dedicated to helping you achieve the smile you desire. We offer a number of dental services, including dental implants. Our experienced, friendly dentists can assess your eligibility for dental implants at our Berwick practice. They will also give you the confidence and reassurance you need before your dental procedure, including all the information you need to know before you commence. Don’t hesitate to find out more about dental implants at our Berwick clinic. Get in touch on (03) 9702 6111 to book an appointment with our dentists today, or enquire online.